Every since you had met the soft spoken wizard, you had been fascinated by him. There was just something about his gentle eyes and shy smile that drew you to him. 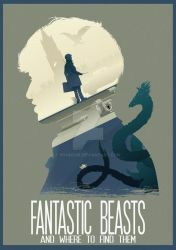 Maybe it was just that you found shy and clumsy to be attractive, or Newt Scamander was just that special. But when he had first showed you what he hid in his plain old case, you were mesmerized. This man, with such an shy and careful personality was carrying a whole new world in his case, several different creatures living with him. And to be able to see him take care of his beasts just made you fall for him harder. Soon enough the two of you fell into a routine; as you travelled around the world looking for more beasts, you'd both take care of his little babies. 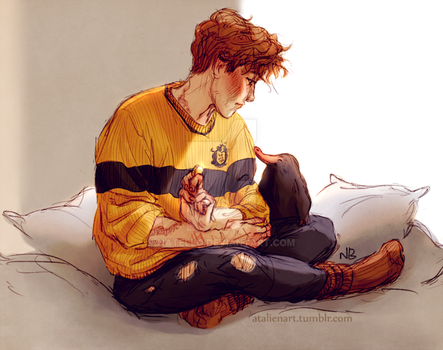 When Newt's was busy with writing his book, you'd feed and care for the adorable creatures. And if some beast required care 24/7, you'd take turns, while one rested the other one tended to the creature.